The Sixth Conference on Ultra-Wideband, Short-Pulse Electromagnetics (UWB SP6), chaired by Eric Mokole of the United States Naval Research Laboratory (NRL) and hosted by the NRL and the United States Naval Academy (USNA), was held at the USNA in Annapolis Maryland (USA) from 3-7 June 2002. UWB SP6 was part of the AMEREM 2002 Symposium, chaired by Terence Wieting of the NRL. AMEREM 2002 continued the series of international conferences that were held in: Brooklyn New York at the Polytechnic University in 1992 and 1994; Albuquerque New Mexico in 1996 as part of AMEREM '96; Tel-Aviv Israel in 1998 as part of EUROEM '98; and Edinburgh Scotland in 2000 as part of EUROEM 2000. The next conference (UWB SP7) will be held from 12-16 July 2004 at Otto von Guericke University in Magdeburg Germany (EUROEM 2004) and will be chaired by Frank Sabath. The purpose of these meetings is: to focus on advanced technologies for the generation, radiation, and detection of ultrawideband (UWB) short-pulse signals, taking into account their propagation about, scattering from, and coupling to targets and media of interest; to report on developments in supporting mathematical and numerical methods; and to describe current and potential future applications of the technology. The session topics of UWB-SP6 included electromagnetic theory, scattering, UWB antennas, UWB systems, ground penetrating radar (GPR), pulsed,. 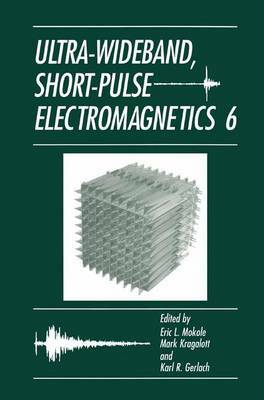 power generation, time-domain computational electromagnetics, UWB compatibility, target detection and discrimination, propagation through dispersive media, and wavelet and multi-resolution techniques.